My parents are Cuban, and I grew up in a Latino community in Miami, but it wasn’t until I had kids of my own that I truly came to appreciate the significance of Hispanic Heritage Month. When my son, Javier, was a toddler and preschooler, I read to him every night. One evening we’d choose a book in Spanish, and the next we’d choose one in English. Thanks to abuelos who insisted my brother and I speak, write, and read in Spanish when we were young, I am fluent in both languages, and I wanted to pass that tradition on to my son. I had amassed the “Spanglish” library during my baby shower, when I asked friends and familia to gift me with their favorite children’s books in both English and Spanish. Even when he was too young to understand what I was saying, I would read to Javier on our rocking chair, the same one his Colombian grandmother used to sit on to read to his own father when he was a little boy. Now that my son is turning ten, he obviously reads on his own, in English, but I still do what I can to read books in Spanish together. He’s not fluent in Spanish, nor can he read it very well, but he can understand just about everything. I figure the more I expose him to it, the more connected he will feel to our heritage, and the better the chances that he may one day choose to become fluent. In the meantime, I take advantage of Hispanic Heritage Month and make a trip to the bookstore each year to pick up new Spanish books we can read together. 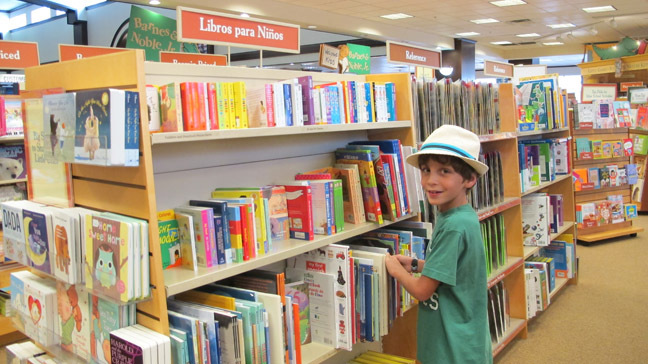 This year we were thrilled to discover that one of his favorite series, The Diary of a Wimpy Kid, is available in Spanish, so we piled up on those. While the stories themselves don’t necessarily have a cultural connection to our community, at least they’re in our native language, which connects him to our heritage. If you’re thinking of starting a Spanish reading tradition with your kids, or you’re simply looking to give your kids books that have Hispanic themes, check out this great crop of tomes in the slideshow.